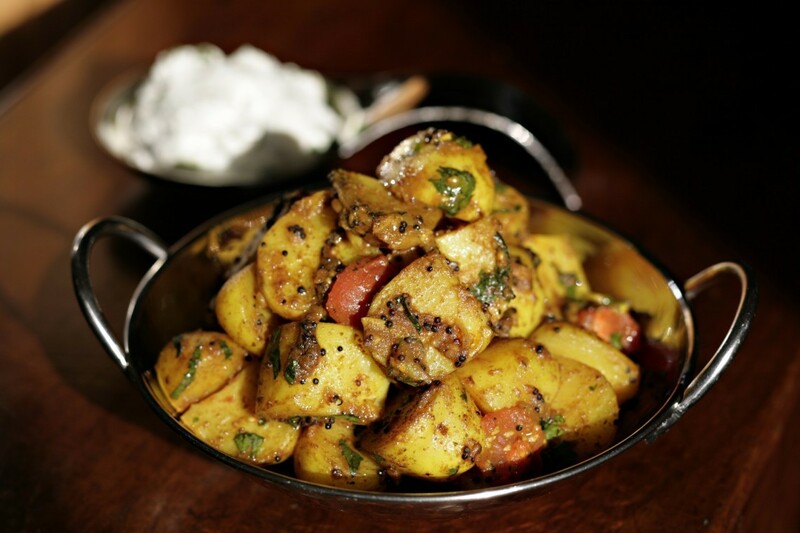 This is a delicious dish perfect for an Indian feast as a side dish or an alternative to rice. 1For the lemon and coriander yoghurt, finely chop the coriander (including the stalks), mix into the yoghurt with the lemon juice and sugar. Season to taste with a little black pepper and set aside. 2Heat a wok or large frying pan and add the oil. Add the mustard seeds and heat until they begin to pop, taking care not to burn them, then add all the other spices and the ginger and stir fry for one minute to release the flavours. Add the potatoes and stir gently to coat them in the spices. 3Add the stock, bring to a gentle simmer and cook for 8-10 minutes or until the potatoes are tender. Stir in the tomatoes and coriander, season with sea salt and freshly ground black pepper, bring back to simmering point for one minute then serve immediately with the yoghurt. This is a great dish for family breakfasts to use up any Christmas Day leftovers, especially if you're cooking for a crowd.